In September, I had the fantastic opportunity to travel to an increasingly popular destination for birding: Honduras. Chris Lotz, the owner of the international bird tour company Birding Ecotours, invited me to join him on a familiarization trip that included several highland sites as well as Pico Bonito Lodge. In this first installment, I will focus on my impressions and experiences in the highlands portion of our tour. As one who is perennially interested in biogeography, the birds found in the upper elevations of Honduras were of particular interest to me. Before finally connecting to the South American continent about three million years ago, Central America consisted of a series of volcanic islands. One of these islands may have been the present day Northern Central American Highlands which includes Honduras, Guatemala, El Salvador, and parts of extreme southern Mexico (Chiapas). This is a fascinating area of transition. Many Neotropical families and genera have some of their northernmost members here, such as the spinetails (Rufous-breasted Spinetail), Tangara tanagers (Azure-rumped Tanager), and guans (Horned Guan). 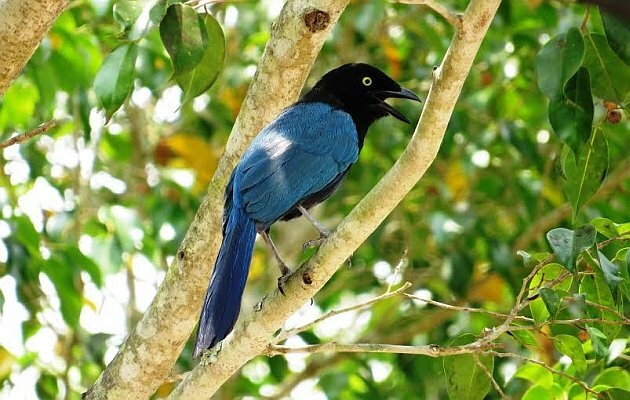 Many Nearctic species and families reach their southern terminus in the Northern Central American Highlands, such as Common Raven, Red Crossbill, Steller’s Jay, and even Brown Creeper. The region is also especially rich in trogons and motmots, two decidedly tropical families with a longer evolutionary history in North America than South America. In short, the mountain birding in Honduras promised a slew of cool new birds. Bushy-crested Jay is one of the Northern Central American Highland endemics, photo by Alexander Alvarado. Our local guide in the highlands, Alexander Alvarado (Honduran Birds) picked Chris and me up from the airport at San Pedro Sula, and we headed straight for the mid-elevation site of PANACAM Lodge for arrival in the late afternoon. 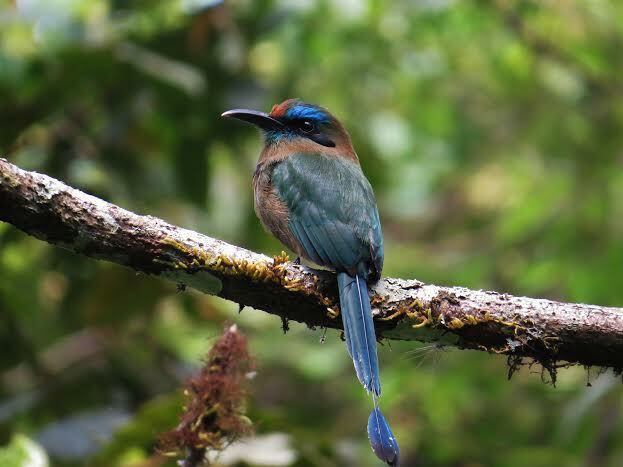 Nestled within beautiful wet montane forest, PANACAM Lodge has quickly gained notoriety as one of the best places in the world to see Keel-billed Motmot. The rumors are true. We observed two of these normally difficult birds within hours of our arrival in Honduras. In fact, we would hear and see several more of these birds at several sites during our trip. Alex also masterfully worked another tricky species into view for us during that first afternoon, Ruddy Crake (a close relative of the Black Rail). We were off to a great start. The following morning, we explored an area of secondary growth and edge near a recently tilled field. Birds came fast during the first few hours, including a wide array of classic Neotropical species such as Keel-billed Toucan, Bat Falcon, Bright-rumped Attila, Buff-throated Saltator, and Boat-billed Flycatcher. A pair of Spot-breasted Orioles were a welcome sighting, having personally lead many clients to their life Spot-breasted Oriole in Miami for their ABA list but having never seen one in their original range. The experience of seeing a pair feeding and calling in the mountains of Honduras felt like a much more genuine birding experience to me. We also observed the beautifully patterned Prevost’s Ground-Sparrow, a sparrow very different from the ones that go by the same name in Costa Rica. Next, we drove to Lake Yojoa, the largest lake in Honduras, an important fishing destination, and home to the country’s best fried fish. The enigmatic White-throated Flycatcher was the most unusual sighting in the weedy edges of the lakeside. This strange little Empidonax flycatcher is a short distance migrant, breeding in hedges and areas of shrubby growth in the highlands and descending to reedy or scrubby wet edges in winter. Satisfied with our views of this demure little bird, we walked over to a shade-grown coffee plantation. Although often celebrated as bird-friendly, my impression of such a plantation met my expectation: great for adaptable summer migrants from the United States and widespread Neotropical species such as Brown Jay but not so great for any even remotely specialized resident Neotropical species (i.e. the species suffering most from deforestation). After some brief birding along the trails at PANACAM Lodge the following day, we drove to La Tigra National Park which sits right above the capital city of Tegucigalpa. Along the highway journey, the habitat shifted radically from wet evergreen forest to dry pinelands reminiscent of parts of Arizona. Arriving at our lodge, Chris and I quickly set our eyes on one of the most charismatic, noisy, and common highland endemics, Bushy-crested Jay. La Tigra National Park is one of the best places to see the extravagant Wine-throated Hummingbird, photo by Alexander Alvarado. The extensive and very beautiful cloud forests of La Tigra National Park, the first national park established in Honduras (1980), serves as an important water reservoir for Tegucigalpa. In fact, the city derives about thirty percent of its water supply from this park. While walking through the trails of this verdant world of cascading waterfalls, cool mists, and moss-laden trees, the forest seemed awfully quiet save for the occasional ethereal carols of Slate-colored Solitaire (which we did see with some persistence). Scouring the undergrowth in this forest is especially productive, producing several sightings of Tawny-throated Leaftosser as well as a covey of Singing Quail with nearly fully grown young and a Scaled Antpitta carrying a beak full of worms (perhaps nesting?). 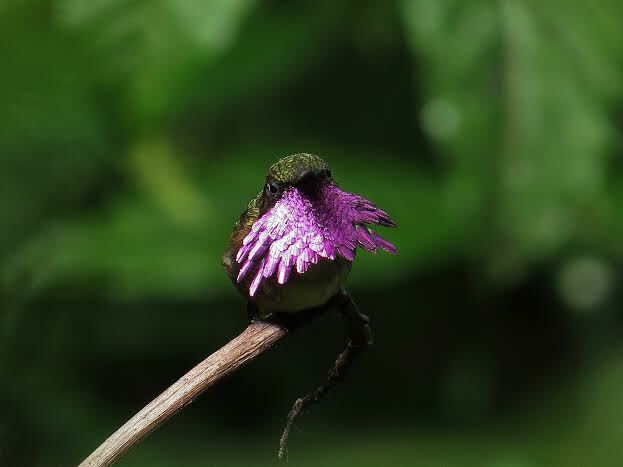 By patiently waiting at a small clearing surrounded by flowering bushes, we also observed three special hummingbirds endemic to northern Central America: Wine-throated, Amethyst-throated, and Garnet-throated Hummingbird. This reserve is also home to a healthy population of the nominate subspecies of Resplendent Quetzal, which has an even more extravagantly long tail than the ones in Costa Rica. Alas, our time here was over too soon. We spent our last afternoon birding with Alex at Naciones Unidas El Picacho Park which allowed us to explore some of the Arizona-like pineland habitat we drove by the other day. I quickly realized that the similarity to the Arizona sky islands is not just superficial, as we observed many shared species. Acorn Woodpecker, Northern Flicker, Greater Pewee, Grace’s Warbler, and White-eared Hummingbird all commonly occur here. Personally, I also love to observe and experience the suburban and garden birds typical of each country that I visit (their “bird” reality), and this site fulfilled that interest. As a birder, it is always so strange yet so interesting to watch the locals enjoying the park, mostly oblivious to the scores of wonderful birds living around them. As we headed back along the entrance road to exit the park, we ran into a significant feeding flock that served as a reminder of how great northern Central America is for orioles: Black-vented, Streak-backed, Spot-breasted, and Yellow-backed were all present for side-by-side comparisons. The following day, we headed out of the highlands and arrived at the deservedly famous Pico Bonito Lodge. Stay tuned. I would like to give a warm thanks to Chris Lotz (Birding Ecotours) for making this trip possible for me. I would also like to give a big thank you to Alexander Alvarado of Honduran Birds for giving us such a great and smooth birding experience for our first half of the trip in Honduras. 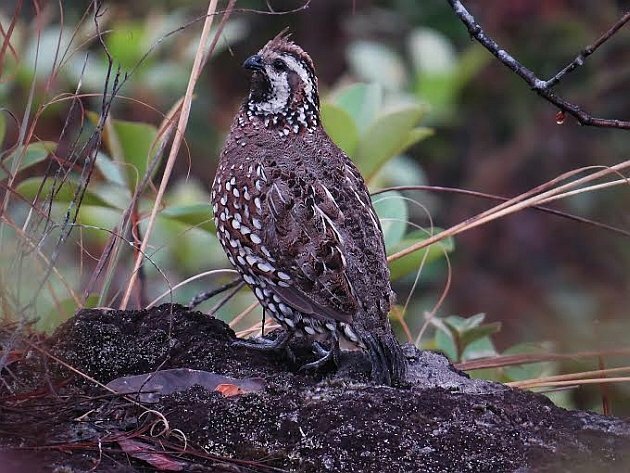 A covey of Crested Bobwhite poked along in the grass just meters away from oblivious park goers, photo by Alexander Alvarado.